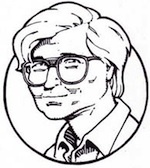 Some of you might be aware that in addition to FOG!, I’m also the publicist for NBM Publishing, the oldest graphic novel publisher in the United States. 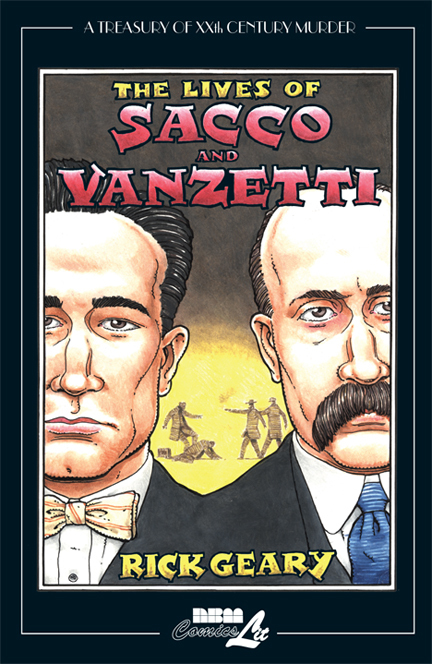 Next week at Comic Con, NBM will be the debuting the latest volume of Rick Geary’s Treasury of XXth Century Murder series, The Lives of Sacco & Vanzetti. These past few weeks I ran an interview with Rick that I conducted for the NBM blog and publisher Terry Nantier gave me permission to rerun it here. 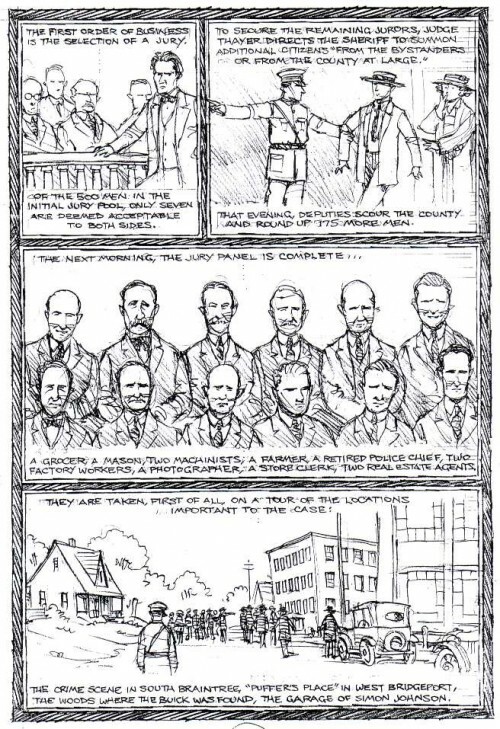 Sacco & Vanzetti, like all of Rick’s true crime work, is simply phenomenal; engaging, informative and representative of some of the best that comics has to offer. Rick also has an Eisner Award Nomination in the Best Reality-Based Work category for his last book, Treasury of XXth Century Murder: The Terrible Axe Man of New Orleans. If you’re at the show, be sure to stop by Booth 1528 and say hello. Have you always been interested in True Crime stories? I date my interest in True Crime to the early 70s in Wichita, Kansas, when a friend of mine, a former cop, showed my his large collection of mug shots. Looking into the literal face of crime was an inspirational thunderbolt! He also gave me a copy of the complete police file on an unsolved murder in Wichita, which I studied and later used as source material for my first published comic story. Your first several volumes were all set in the Victorian era and then moved into the 20th century. What elements are the most essential, in your opinion, for a true crime story to be told in a graphic narrative? I’m most drawn to unsolved cases and most of my books deal with those for which there’s still a major level of controversy. The lack of resolution provides a sense of mystery and drives the narrative forward. For those stories in which we already know the culprit (like the H H Holmes and John Wilkes Booth), the goal is more of a character study: how and why was the crime committed? I also like those cases that contain a great amount of visual interest. For this reason I choose to concentrate upon the crime itself and the investigation. The trial isn’t nearly as interesting, since it’s all talk and most of the relevant information is already known by that time. You’ve done several adaptations of classic literature. Do you find doing your True Crime books more challenging because you need to discover and craft the narrative? That’s correct. In adapting classic literature, I feel I have the responsibility to be true to the author’s original vision. With a True Crime case, I deal with several differing points of view, and must sometimes organize a mass of disparate facts and theories into a unified narrative. For this reason, it’s much more challenging. What is the general process of idea to graphic novel? I always have a short list of crimes I’d next like to deal with, and once I decide upon which one, I read all I can about it, and try to find as much picture reference as is available. Once the script is completed, I start on the pencils, after which comes the final inking. During every stage, the story can undergo revisions and corrections, depending upon newly received information. Do you feel that True Crime has become too exploitive as tabloid journalism has become more prevalent? Tabloid journalism seems more prevalent today because there are ever more outlets for it, in print, on TV or online. But the murders of the 19th and early 20th centuries lacked nothing in their exploitation by an scurrilous, scandal-obsessed and sensation-seeking press corps. Is there any interest to go further into the 20th century and examine True Crime stories such as the Kennedy or Martin Luther King assassination or the OJ Simpson murders? I would love someday to tackle the JFK killing or the OJ case or the Jon-Benet Ramsey case, but at present they are too recent and still have too much heat surrounding them. I would need for a few more decades to pass in order to treat a subject with the sort of ironic detachment that I try for. What drew you to the Sacco and Venzitti story? I’m always drawn to the cases that still have major questions or controversies clinging to them. In addition, the Sacco & Vanzetti story was a major Cause Celebre of the early 20th century that is largely forgotten today. I felt that the story had a political content that I hadn’t treated any any of my previous books. What kind of research did you do for this story? Do you go to the actual locations (like South Braintree, Massachusetts), or do you rely on books and the internet? My research for this story consisted of reading as many books and articles on the case as I could find. It’s usually helpful to visit the actual scene of the crime, if only to soak in the atmosphere, as I’ve done with several of the murders I’ve written about. But in this case, the original street and buildings in South Braintree have been long-ago demolished and the area is now unrecognizable. This particular case had two different trials, two appeals, and various demonstrations and protests. Do you think this was the result of anti-Italian prejudice, a government reaction to their politics or both? The prejudices of the time, against immigrants in general as well as political radicals, played a huge role in the Sacco & Vanzetti saga. The long and drawn-out appeals process in their particular case was the result of the state system trying to appear fair and even-handed, when, in reality, the gears were in motion from the beginning and the outcome was never in any real doubt. Do you write a book with a point of view or do you try to remain neutral? Most of the true crime cases I’ve written about, especially the unsolved ones, are famous and controversial enough to have spawned many competing theories and opinions. In some instances I might have ideas of my own, but in my treatment I try to remain neutral and depict every point of view, no matter how crackpot, with equal weight. Among Sacco and Venzitti’s supporters were Dorothy Parker, Albert Einstein, George Bernard Shaw and H. G. Wells. Did this impact their careers or public perceptions? Most of their supporters already had reputations as leftists or radicals or artistic outsiders, so I don’t think their actions did any lasting harm to their careers. Governor Michael Dukakis stated that Sacco and Vanzetti had been unfairly tried and convicted and that “any disgrace should be forever removed from their names.” Do you think this was a fitting epilogue to the story? As you might expect, Dukakis’ declaration failed to satisfy most people. For some, it went too far (Sacco & Vanzetti were, after all, convicted murders), for others, not far enough (they should have been granted a full pardon). It failed to settle anything, and for this reason, it’s as fitting an epilogue as we’re likely to get. NBM will also have a special very, very limited edition being made available online exclusively at NBM’s site or by mail of this volume with a special bind, a tip in sheet of art specially done by Rick for this and numbered and signed by him. HURRY! Only 25 copies are being made available. This will not be in stores! FOG! Free Comic Book Day 2018 Preview!